Keith Hallam recalls memories of a magical boyhood at the Abbey Stadium with his Dad John, United treasurer from 1961 to 1971. There was magic in the air in the 1960s, but for me it wasn’t to be found on King’s Road, Chelsea or by listening to the Beatles. I was a boy starting out on my teens, mad crazy on football, and the magic was being played out along Newmarket Road, Cambridge. The soundtrack was provided by the ever-increasing noise United were making as they knocked harder each year at the door of the Football League. That noise became too much for the League chairmen in May 1970, when 31 of them voted for Cambridge United to be hoisted up and out of the Southern League and into Division Four for the first time. Sadly for Bradford Park Avenue, they only got 17 votes and we replaced them. Also finishing in the bottom four of the 92 that year were Darlington, who got 47 votes, Hartlepool (42) and Newport County (31), and they all stayed up. United’s closest non-league challenger was Wigan, who polled 18 votes. Cambridge City got two and Wimbledon none. My Dad, John Hallam, was the United treasurer and, as the keeper of the coffers, he was one of the backroom team that had been busy getting the club ready for this moment for several years. I too was doing my bit: I sat at home every Tuesday evening at the very heart of ‘operations’ – or so it seemed to a 12-year-old – counting the players’ wages into small, square, manila wage packets. Occasionally, if a player had been picked for both midweek and Saturday games and scored a goal, a wage would come close to £100. ​Very occasionally, Dad would let me take the heavy Clarks shoebox full of wage packets into the dressing room on a Wednesday night and hand them out. He didn’t have to tell me who was who, for I probably knew more about the players than their own children did. I would like to remember this as an orderly event, with players sitting quietly until I called out their names. The reality, I’m afraid, was that there was a bit of a scrum, with wage packets disappearing rapidly out of the box followed by a rub of my head with rough, mud-encrusted hands. Muffled obscenities followed from the lower earners. It was such a thrill for a kid! ​Mum, Dad and I had moved from London to Buristead Road, Shelford in 1960. The three-bed semi cost £2,000. Dad was an accountant and had been offered a job with Progressive Coaches, which was owned by United director Paddy Harris. It only took Mr Harris a year to persuade my old man that he should also handle the books at United in his spare time. He was to be the honorary – in other words unpaid – treasurer. Things were different in those days, and Dad told me that one of his first duties was to accompany manager Roy Kirk to the Supporters’ Club and return to the dressing room with a large crate of brown ale – at half-time! 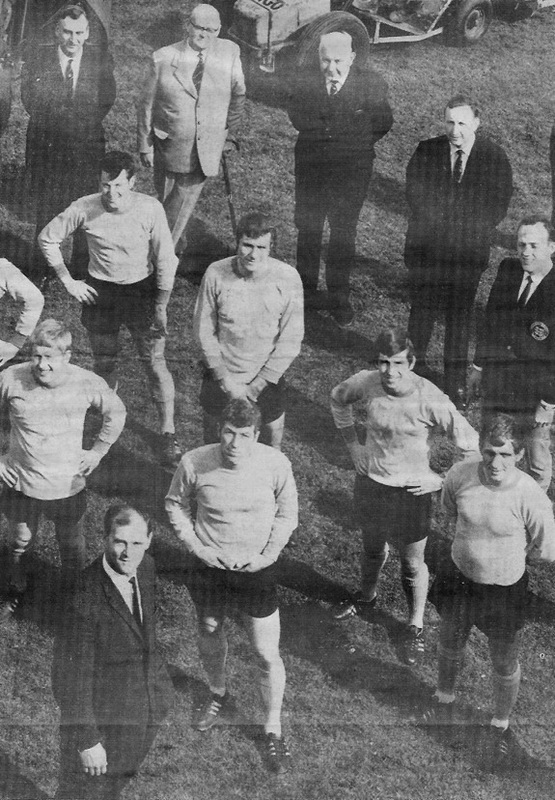 Part of a photograph from the Cambridge Evening News of 3 May 1969 – the day United beat Kettering Town 3-0 to clinch their first Southern League title. Back: director Charles Heffer, vice-chairman Paddy Harris, chairman John Woolley, treasurer John Hallam, coach Mick Brown. Second row: players Roly Horrey, Gerry Baker, Jimmy Thompson and Robin Hardy. Third row: players Mel Slack and Bill Cassidy. Front: manager Bill Leivers. 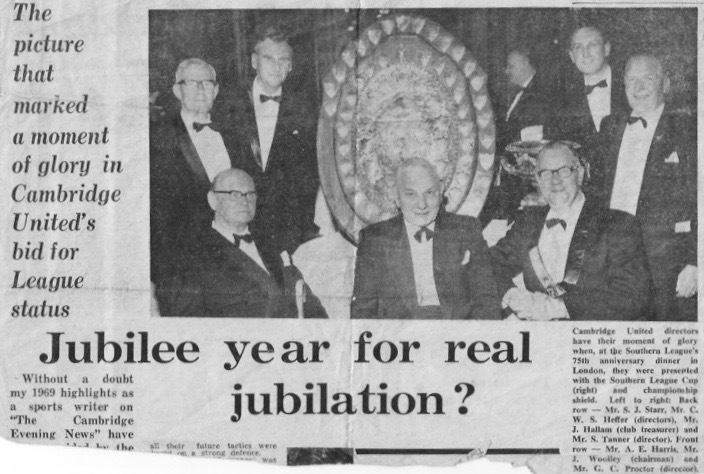 Cambridge Evening News cutting from 1 January 1970, showing Cambridge United directors and treasurer John Hallam with the Southern League Cup and the Southern League championship shield. Back: Stan Starr, Charles Heffer, John Hallam, Sam Tanner. Front: Paddy Harris, John Woolley (chairman), Geoffrey Proctor. A couple of times I found a ball and me and my mate would sneak out on to the pitch for a quick penalty or two, but the booming voice of Mr Leivers had us scuttling for cover: ‘Oi, you lads, get off the bloody pitch!' – and rightly so. I recall the time I suffered a bad ligament injury playing rugby at school, just before an FA Youth Cup game. I played for Ely Crusaders and we were up against Corby Town – a massive occasion for us young lads. My ankle had turned blue and Dad rang Bill Leivers at home for advice. Bill was kind enough to put us in touch with the club physio John Simpson, who when he wasn’t working his magic with the United boys was a budgerigar trainer, as I remember. I had a very special 40 minutes on John’s treatment table, open mouthed at his crackling ultraviolet glass wand. It helped, but we lost. Much of the treasurer’s time in those days was spent supporting the fundraising work of Dudley Arliss and his sales team in the pools office. Dudley’s work helped to give the U’s the sound financial foundation they needed to challenge for a place in Div 4. We were very pleased to have Dudley’s son Barry with us at Dad’s funeral in June 2015. When Dad wasn’t at United or Progressive Coaches, he was refereeing. When he retired from reffing in 2002 he was 75 and had officiated in 2,100 games over a 56-year career. He usually reffed in local leagues but would occasionally get a local amateur cup final or an early rounds FA Cup match. One particularly proud moment was a 1967 Cup local derby between Kettering and Wellingborough. Dad reffed the first game, which was a draw. He did well and was appointed to take charge of the replay at the Dog and Duck ground. By the time of the game, which was played in front of a record 4,500, the draw for the next round had been made and it was known the winners would play Cambridge United. 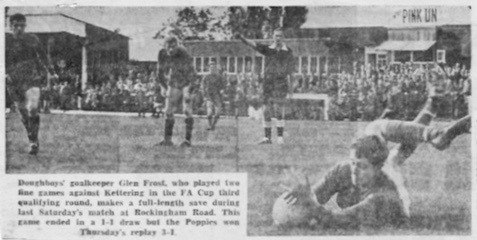 Bill Leivers was there to watch the replay, and this time even the local paper commented on the fine run-out by the Shelford referee. To top it off, Bill spoke to him after the match and said: ‘Well done John, best referee I’ve seen all season.’ I have never seen my Dad smile so broadly as then. He would always take a whistle and stopwatch to United games just in case, and many was the time during his ten years there that the ref or linesman would feel ill or pull a muscle and Dad would be called on to take up the flag in Southern League matches – often in borrowed trackie bottoms. The club often had to find its own referee for pre-season and testimonial matches and he would turn out, happily doing what he knew best. I have old matchday programmes showing him as ref or linesman in games at the Abbey, including Rodney Slack’s benefit match in 1966 and games against Hapoel Tel Aviv (1963), Notts County (1966), Norwich City (1967) and Chelsea (1968). Interviewed by the Cambridge Evening News in 1996, as he notched up 50 years as a ref, John said: ‘I have never achieved much, been anywhere in particular, or done anything special to mention.’ Well, I beg to differ. It is plain that he spent his life devoted to other people’s causes, whether in sport or business. Never a penny was earned from his work at Cambridge United and little more than travelling expenses came from 56 years as a football referee. He did both jobs because he loved them dearly. In retirement, after a long accounting career with Pye, Philips and Cambridge Electronic Industries, he found time to take on the books of many local businesses: printers, hairdressers, shopkeepers, garage owners. He would help with company formation, explain tax rules and do battle with the Inland Revenue if required. He preferred not to ask a fee from smaller businesses, simply saying it was his pleasure to be a help. Thanks for all your help, John. Below, John Hallam John refereeing Kettering v Wellingborough in the 1967 FA Cup. 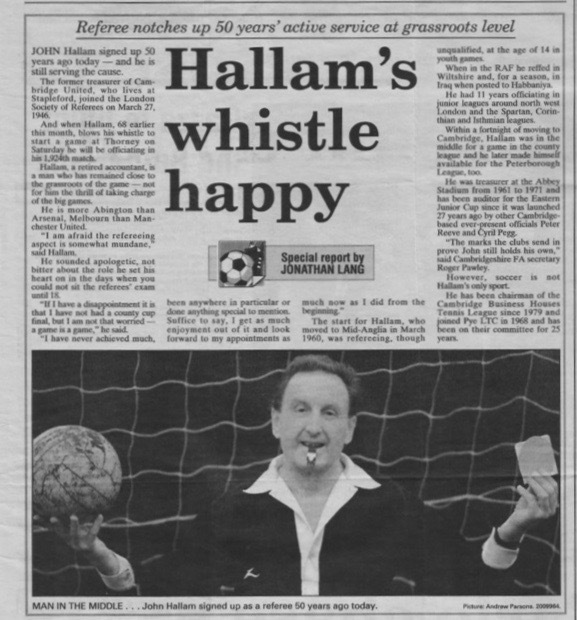 Right, a Cambridge Eveing News story of 27 March 1996 looks back on John's long refereeing career. ​Have you got a story to tell? Contact 100 Years of Coconuts here.